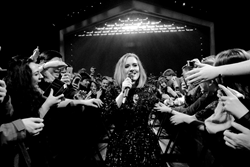 Used by Adele and her three backing singers, Sennheiser’s flagship Digital 9000 system microphones are a vital component on tour. For Sennheiser, being part of such a prestigious, high production value tour fits perfectly with its ethos of providing world-class, innovative solutions that continually push the boundaries of audio technology. “We haven’t had any problems with RF,” adds Joe. “The main challenge we have here is the antenna system. We don’t get to place it where we’d ideally like to have it because of the problems with sight lines, etc. There’s nowhere on the stage that’s high enough to make it ideal, so we have placed one antenna stage left on the back handrail. It could do with being at least a meter higher, but then it would be in front of the LED screen. Eleven SR 2050 IEM transmitters for 22 stereo IEM mixes.